I mentioned last week that it’s a quiet Thanksgiving season for me. I keep meaning to test a new pie or make stuffed squash or mash potatoes or do something else that feels seasonally appropriate, but I’ve had my hands full with work and school lately, and in the down time I’ve been prioritizing life outside the kitchen. I may catch up on festive cooking by the time Christmas rolls around, but for now, it feels alright to be taking it easy. Still, the upcoming holiday is on my mind. This week I got to thinking past Thanksgivings, and about how I’ve always overshot with my cooking, no matter how hard I try not to. During our first year in NYC together, Steven and I had my mom over for Thanksgiving dinner at our place. While I was delighted to take charge of the meal (I’d never really been able to do that before), I overextended myself so much that by the time we all sat down I could barely keep my eyes open. I don’t even remember what I made. I’ve learned a lot about cooking for friends since then, and I like to think that if I do a Friendsgiving next year I’ll be able to avoid holiday meal-prep burnout. It’s taken me a long time to realize that guests are usually happy—maybe even relieved—to eat simple food, especially if it means that their hostess is relaxed and able to have a good time. 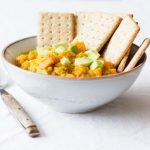 This creamy vegan cauliflower corn chowder is exactly the sort of thing I’d whip up if I were having people over or cooking for a gathering this year. It’s filling, so in theory it could be paired with sides and salads to make a complete Thanksgiving meal, without the need for a fancy entree. It’s savory and creamy with a hint of sweetness from the corn. And, since it features a mix of cauliflower and potato, it’s hearty without being heavy. Does this really qualify as chowder? Maybe not. It isn’t thickened with roux or crackers, and there’s no seafood, so I really don’t know. But I tend to name recipes with the spirit of the meal in mind, and for me, this one evokes the experience of eating traditional New England soup and potato chowders as a kid. I think cornbread is an ideal accompaniment (I’ve been eating it with my simple, whole grain vegan cornbread), but regular toast would be nice for scooping up the bottom of the bowl, too. 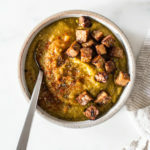 The soup can be made into more of a whole meal by adding greens, tempeh bacon (or another vegan bacon), smoked tofu, or roasted chickpeas, and it makes plenty of leftovers for freezing and reusing. Place the cashews into a powerful blender with 2/3 cup water. Blend for 1-2 minutes, or until you have a rich cashew cream. Set the cream aside. Heat the olive oil in a large pot over medium heat. Add the onion, carrots, celery, and garlic. Cook, stirring frequently, for 8-10 minutes, or until the carrots are getting soft and the onion is clear. Add the cauliflower, potatoes, 1 cup of the corn, broth or water, smoked paprika, salt, pepper, and bay leaves to the pot. Bring the mixture to a boil. Reduce the heat to a simmer and cook, covered, for 20 minutes, or until the potatoes and cauliflower are completely tender. Turn the heat off and remove the bay leaves. Puree about half of the soup with an immersion blender (or transfer half to a standing blender and puree, being careful to avoid spattering). 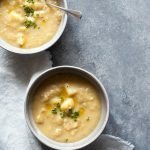 The soup should be creamy, but some pieces of cauliflower, potato, and corn should be visible. Taste the soup and add extra salt and pepper as needed. Add the remaining cup corn to the soup, along with the cashew cream (or coconut milk). Bring the soup back to a simmer, and cook, uncovered, for 5 minutes. Serve, with any accompaniments you like. *In place of cashew cream, you can use 1 cup light or full-fat coconut milk. Leftover soup will keep up to five days in an airtight container in the fridge. Soup can be frozen for up to two months. Putting the whole Thanksgiving thing aside for a minute, this is such a satisfying and dependable fall or winter soup to have around. 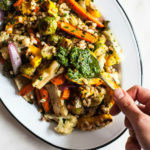 I’ve been enjoying it with greens and some chopped, smoked tofu for lunch this week, and I’m excited to serve it up with a couple of hearty dinner salads over the weekend. Whether you consider it for a holiday table or not, I hope it might give you the same comfort and pleasure it’s given me. I’ll be back for the usual roundup this weekend. No major holiday recipes next week, but I do have a protein-rich, savory breakfast that I’m excited to be getting on the blog (it’s a favorite around here), and also a simple, nourishing vegan bowl recipe to help ground you as you move into the busy month of December. See you soon. I just finished making this chowder and wanted to say thanks! It’s very tasty and I love he texture. For me, the corn (along with that whole texture thing) makes it feel very “chowder” like. I’ll have a look at that cornbread recipe too (more texture) because I bet that would be a good accompaniment. Hi Libby! Almond cream will work, if you have a high speed blender to make it (almonds are harder to blend than cashews). I don’t think the texture or richness would be too much, but I’m guessing that the consistency will be less smooth and creamy, especially if the almonds have their skins on. Definitely worth a try, though, if almonds are your preference. Let me know how it goes! Thanks Gena! I really was wondering about the differences between the nuts and hadn’t thought about those almond skins! Maybe I’ll do a little experiment to see how it works. This is So Yummy! Have made it a few times, including for friends who immediately asked for the recipe. 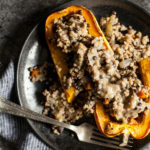 Hearty, flavorful, and oh so easy – especially using the coconut milk instead of cashew cream! Thank you for another wonderful chowder in our recipe book! I’m delighted that you like it, Jane! Thanks for letting me know.